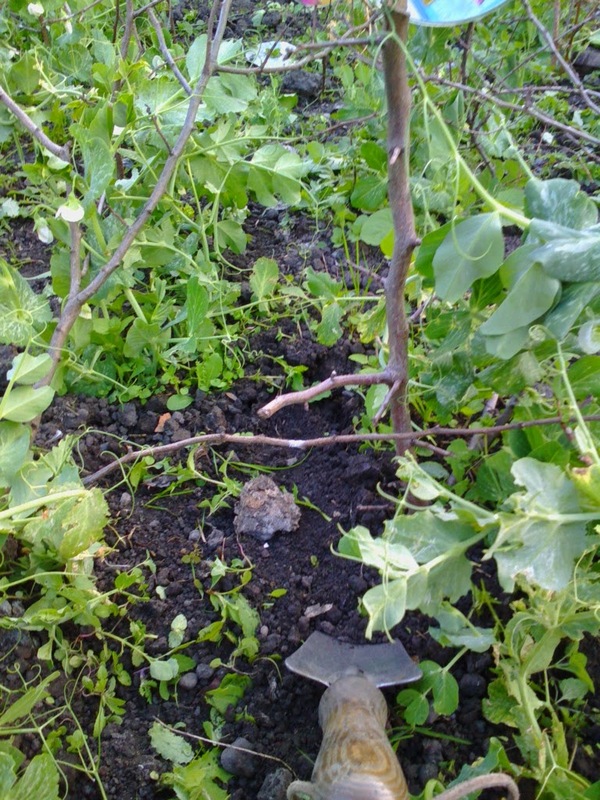 Weeding peas is a fiddly job! Peas need plenty of water but of course that encourages the weeds as well. In the gap between rows, hoeing is possible if you are careful but otherwise it is a hands and knees job! Be very careful, peas at this stage, just flowering and producing the first peas, can be uprooted very easily and peas will often try and use the nearest object, e.g. a weed, for support instead of all those pea sticks collected over previous months. I have found that, despite getting dirt up fingernails and on hands, it is better to dispense with gardening gloves in order to pick out the weeds from in amongst the peas. This year has been cold for them, the earliest pods did survive the frost but went a bit of a funny colour, but now there's plenty of pea flowers and pods forming. CDs on strings have also been used as a defence against sparrows looking for a nice bit of greenery to munch!